The book on Greece and Rome with Gary (Devore) [Link] is close to being done. 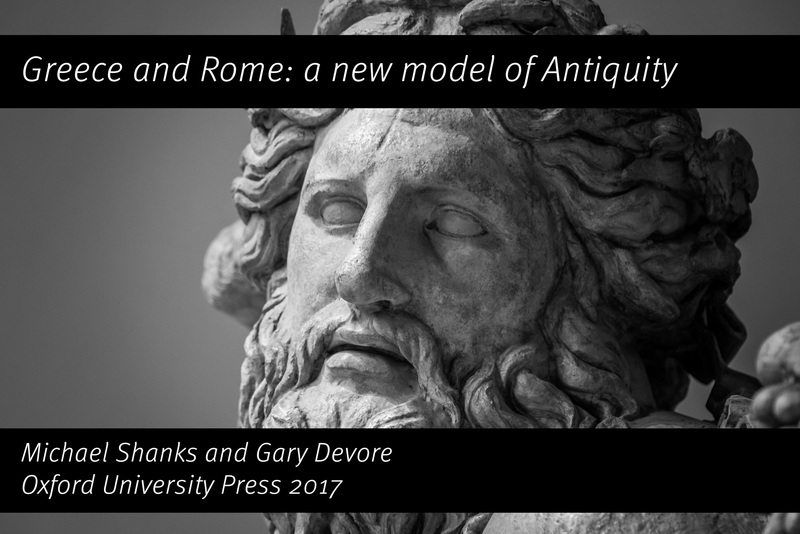 We’ve chosen to offer a quite different kind of account of antiquity and we’re delighted with the scope of its underlying model and perspective (archaeological and focused on the topic of membership of body politic). It’s the success of our approach that has slowed things down – but this summer will see its delivery to Oxford – the textbook/trade division in New York (the book will be large format, full color, lots of maps and diagrams and pictures). For me, it’s my attempt to pull together a fascination with the ancient world that began when I took up Latin and Greek as a ten year old, researches into ancient art and design, surveys of ancient urbanism in the Mediterranean and Roman north, modeling the workings of power and agency with a Marxian/Weberian twist, and now informed by a paradigm in Strategic Foresight. It’s the biggest project I’ve undertaken. Meanwhile, I’ve neglected much else, or at least I’ve not been writing on much else here online. My chorographic fieldwork in the English/Scottish borders has continued with two trips – in February and June [Link]. Mike (Pearson) was with me in February – we’re working on a new edition of our book Theatre/Archaeology. Joining Larry Leifer in his Center for Design Research is proving to be a great base for my interest in expanding the human component of human centered design with an archaeological outlook. This is focused on the revival of a long-standing Stanford group – Foresight and Innovation [Link]. My work with Stanford Revs Program has shifted to this new home (automotive pasts, presents, futures), as has what we (with Chris Ford) are calling Urban Futures – long-term perspectives on urban dwelling and design, and, in a continuation of the mission of Stanford Humanities Lab, an affiliation with the Future Learning Lab in Norway. I was keynote at their conference in May [Link]. I’m also being approached by more and more corporations and organizations interested in how to take account of culture in their efforts to shift to the more human-centered outlook of the designer. This year so far I’ve worked with SAP, Severstal, Airbus, and hosted a fascinating talk by Sergey Kravchenko, VP of Boeing, a business visionary who completely got the relevance of an archaeological outlook. CityInnovate is a new partner with our Urban Futures initiative, building on my advisory work with the Mayor and City of Rotterdam [Link]. I’m expecting closer connections with the Historic Vehicle Association of America to offer scope for completing my researches and writing that started with Stanford Revs Program [Link]. My lab at Stanford, Metamedia, now with the moniker Pragmatology [Link] is receiving a clear out, is refreshed with relaunched websites [Link], and as a home for some wonderful researchers – Anja Krieger, Anne Duray, Nolan Epstein, and Catherine Teitz.